TheAmericanRailwaySupplyCompany was founded in New York in 1891. The Hoole Manufacturing Co. and possibly E. J. Brooks were two predecessors of American Railway Supply. American Railway Supply lasted well into the 1920s. They are also very well known for making cap badges. It isn't clear when they stopped making baggage checks. Their Shell checks are prolific. I have two fairly early American Railway Supply shell checks. One is made for the Concord & Montreal RR which operated from 1889 to 1895. It is literally dated 1895 on its paper insert. It can be found on the types page. 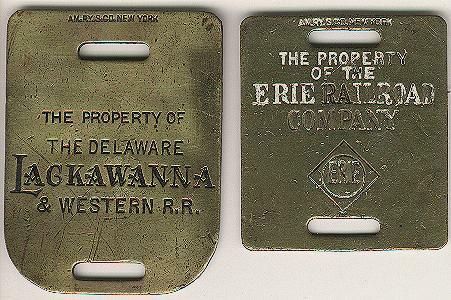 The other is from the Baltimore & Ohio Southwestern Railway, which operated between 1889 and 1900, when it was absorbed by the Baltimore and Ohio RR. Of the three hallmarks for American Railway Supply the AM RY S. CO. NEW YORK and AM RY S. CO. N.Y are believed to be earlier than the AMERICAN RY S. CO. NY hallmark. 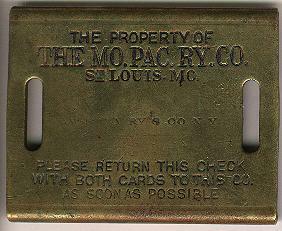 Missouri Pacific "MOPAC" Ry. Shell check with a faint hallmark across the center. Note the request to return the check with both cards (inserts).